Hide the tool bar when the page-flipping book full screen displayed? There must be this kind of requirement that hide the tool bar of the page-flipping book when it is displayed at full screen. It looks much more clearly when full screen, isn’t it? Anyway I am going to teach you how to hide and return to the standard interface it on MAC version. 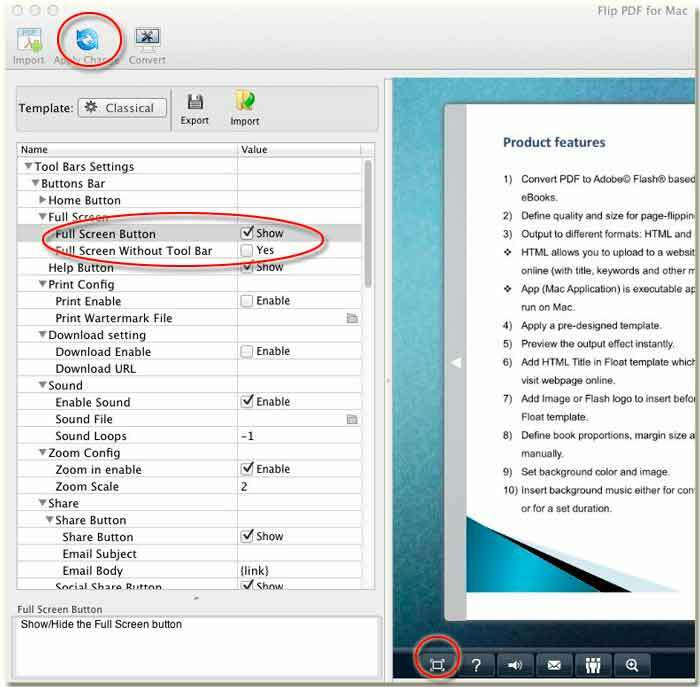 Are you ready your FlipBook Creator for MAC? Now, please land it and do as I say. Step1: Move your eyes to the left settings list. Step2: Do you see the gray highlight area “Full Screen Button” and “Full Screen Without Tool Bar”. Yes you have known of that, first you should check “Full Screen Button” and then you just have the opportunity to check the second “Full Screen Without Tool Bar”. The first is the premise of the second one. After that you must confirm you have clicked the animated icon of “Apply Change” on the top menu line for apply the changes just now to the preview flash page-flipping book. After you completed all above actions, yean, we come to test the function of “Full Screen”, at the middle preview box, you could click the down-right corner icon “Full Screen” to check whether the bottom tool bar hided, at last press the key “Esc” on your left hand top-left area. Copyright © 2012 flippagemaker Software Co., Ltd. All rights reserved.